The Court of Arbitration for Sport's decision Tuesday to reduce Maria Sharapova's suspension for not intentionally doping resolves the playing fate of the biggest tennis star ever caught using a performance-enhancing drug. But an Outside the Lines investigation has found that the saga's most surprising element is that tennis' anti-doping efforts actually caught a marquee player doping at all -- intentionally or not. Men's and women's pro tennis carries a decades-long, pristine image in large part because it has never faced a damaging, ongoing and widespread performance-enhancing drug scandal. That cleanliness has paid dividends: Annual sponsorship revenue is north of $250 million; long-term broadcast rights fees will top $1 billion in the coming years; and star Novak Djokovic this year became the first player to bank more than $100 million in career prize money. Said ATP chairman and president Chris Kermode: Tennis is "in the best place it's ever been. Sponsors view it as a premier sports product, as sort of a high-end sports product. ... People see it as a clean sport." But Outside the Lines has found that clean reputation is largely due to lax anti-doping efforts by the sport. Year after year, the testing methods tennis uses have been deemed generally ineffective and unreliable by experts. It has spent -- until recently -- little effort and money on aggressively testing for the drugs that provide players the most benefit in the modern game: erythropoietin (EPO), growth hormone and synthetic testosterone. And the sport tests athletes at the same level as lower-profile and less-lucrative sports such as handball, canoeing, kayaking, triathlon and volleyball. Over the past decade, when tennis has caught players violating drug policies, the bulk of positives have been for stimulant and recreational drug use. Among the more prominent cases: former U.S. Open champion Marin Cilic tested positive for a banned stimulant and had his suspension reduced after arguing he inadvertently ingested the substance in the form of a glucose tablet; Richard Gasquet tested positive for cocaine and had his suspension reduced after arguing he had ingested the substance inadvertently while kissing a woman in a Miami nightclub; and Martina Hingis was suspended after a positive test for cocaine. The only pro tennis players busted for the performance enhancers that traditionally give athletes the biggest boost, the most basic of which are anabolic steroids, have been journeyman Wayne Odesnik and four never-heard-of teenagers. Which sport federations catch the most dopers? Sharapova tested positive for the newly banned substance meldonium, a heart medicine that is believed to also improve exercise capacity in athletes. Sources close to the tennis star told Outside the Lines they believe the International Tennis Federation has made an example of Sharapova to show they're "tough on anti-doping." "I made a statement a couple years ago that I thought tennis was not doing enough -- and tennis jumped all over me," said Dr. Donald Catlin, an anti-doping pioneer who founded the UCLA Olympic Analytical Laboratory. "But I am also quite sure that their testing is minimal, and I wouldn't trust them." According to a confidential survey by ESPN this year of 31 professional tennis players, 65 percent who answered claim the sport doesn't drug test enough and say they personally know a player who has used PEDs. Yet 71 percent also estimated that less than 10 percent of players have benefited from PEDs, a widely held estimate throughout sports, according to anti-doping experts. A confirmed supplier of performance-enhancing substances told Outside the Lines about providing PEDs to 12-15 current and former pro male tennis players. The supplier said the tennis anti-doping program has been "Mickey Mouse" and "antiquated" for years, adding: "Their testing was lackadaisical ... doing something [only] to appease." Because of that, the supplier said, none of those clients have ever been caught by tennis' anti-doping efforts. Tennis' two biggest PED busts can be attributed to fortunate timing and luck: Sharapova was caught in a roundup with hundreds of other international, non-tennis athletes who tested positive for a banned substance sold over the counter in Russia; Odesnik was initially banned after Australian customs agents found vials of human growth hormone in his misplaced luggage on the eve of the 2010 Australian Open. Sharapova, ousted in June for two years after the positive test from January's Australian Open, contended an administrative error led to her not being informed that a drug she had taken, meldonium, had been placed on the prohibited-substances list just weeks earlier. The three-person Court of Arbitration for Sport ruled Tuesday that her suspension should be reduced to 15 months after determining that she acted with "no significant fault." She can play again in April. On the other end of the notoriety spectrum sits Odesnik, who is out of second chances. His tennis-doping résumé places him in rarefied air: the only player ever tied to growth hormone; the sport's only player to twice fail drug tests; the 15-year suspension given to him is the longest ever given a player; and the only player to take advantage of the ITF's little-known Substantial Assistance Agreement, a deal requiring players to give up information on fellow tour pros. After the incident involving his misplaced luggage, Odesnik cooperated with tennis officials in their investigation, and an initial two-year suspension was halved. He was supposed to have forfeited $90,000 in prize money, too, but Outside the Lines has been told that never occurred. Stuart Miller, the executive director of the ITF's science and technical department, initially told Outside the Lines that the forfeiture had been enforced. Asked later to clarify, Miller said Odesnik returned $10,000 after a second suspension in 2015. Miller then said information about the $90,000 in prize money was "confidential." Odesnik, who is now employed in South Florida as a financial representative for a major investment firm, declined multiple interview requests for this story. His attorney, Christopher Lyons, also declined comment. Back on tour after his initial suspension, Odesnik in 2013 was linked to Biogenesis, the Tony Bosch-run South Florida wellness clinic with PED ties to more than a dozen Major League Baseball players. Miller, tennis' anti-doping boss, told Outside the Lines that current MLB commissioner Rob Manfred, then overseeing baseball's investigation, shared clinic files with tennis leaders. But Odesnik again proved vague and evasive under questioning, though he did volunteer the names of other South Florida individuals -- including a doctor who wrote a prescription for HGH for him, as well as two other PED suppliers. In the wake of the Biogenesis scandal, both the ITF and the United States Anti-Doping Agency target-tested Odesnik out of competition -- especially for a growth hormone peptide that appeared frequently with athletes whose names appeared in clinic files. In late 2014 and early 2015, he failed three separate tests and was banned from the sport for 15 years -- the longest suspension ever given a player. To determine the state of PED testing in tennis, Outside the Lines interviewed more than 50 players, coaches, people associated with the PED underground, sports scientists and officials, as well as reviewed a decade of drug-testing data and doping suspensions in tennis and other professional and Olympic sports. Like most sports, tennis follows the World Anti-Doping Agency drug-testing code. Tennis is grouped by WADA with summer Olympic sports federations such as swimming and track and field. WADA-accredited testing labs offer a menu of tests and protocols to sports like tennis that leaders can select to root out doping. Tennis' anti-doping protocol for years relied on the cheapest, most basic screening offered by WADA labs. For about $300 per sample, the standard lab analysis is largely capable of detecting only anabolic steroids, stimulants and street drugs. It is almost incapable of detecting cutting-edge substances, instances of micro-dosing or the latest rage: designer peptides that trigger the body's natural release of testosterone and growth hormone. Only in the past two years has tennis significantly increased a portion of its protocols: The total number of all samples collected outside of competition as well as the overall number of blood samples collected. Other than Odesnik, tennis has never caught a player using any of the presumed most beneficial, cutting-edge substances -- EPO, HGH or synthetic testosterone. Tennis has built its clean image largely on in-competition drug testing -- seen throughout the anti-doping community as futile and capable of catching only unsophisticated dopers, because players know when and where testing will occur. According to annual WADA doping reports covering 2010 to '14 (the latest reports available) in-competition testing was tennis' method of choice for more than 80 percent of samples analyzed by tennis -- significantly higher than in other summer Olympic sports. Despite wide suspicion over two decades about EPO use in tennis, only one in 16 player samples overall have been analyzed for the endurance-enhancing substance. 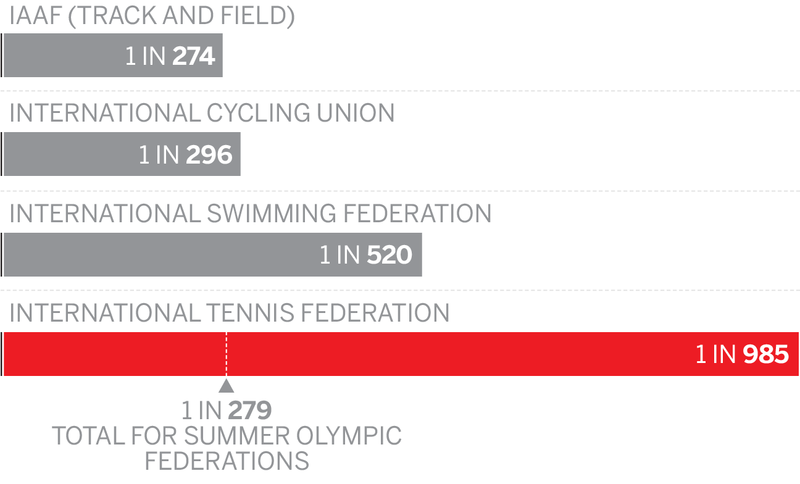 Other summer Olympic sports have tested for EPO more than twice as often. Of all samples taken since tennis began testing for the substance in 2012, only one in 32 were collected out of competition and screened for EPO, according to the latest WADA test data. Isotope-ratio mass spectrometry, or IRMS/CIR testing, the most advanced method of detecting synthetic testosterone, has been used by tennis since 2012 but only sparingly: one in 44 samples analyzed overall, a slightly lower rate than other summer Olympic sports. 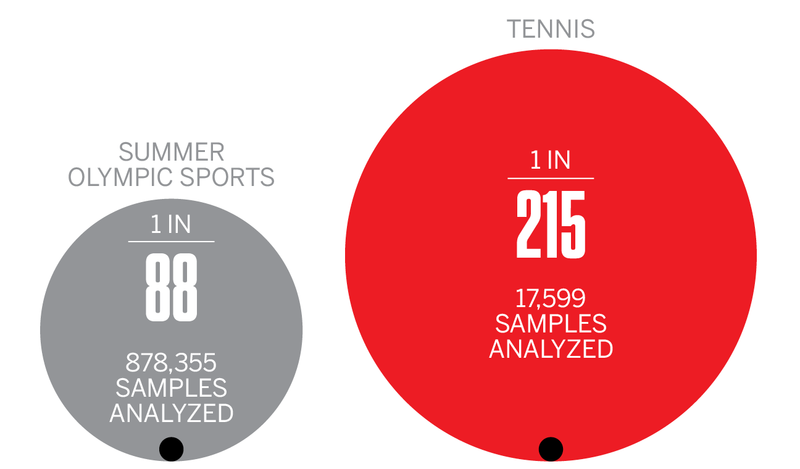 For out-of-competition testing, only one in 138 of tennis samples taken have been analyzed using IRMS/CIR testing, compared with 1 in 84 for other summer Olympic sports. 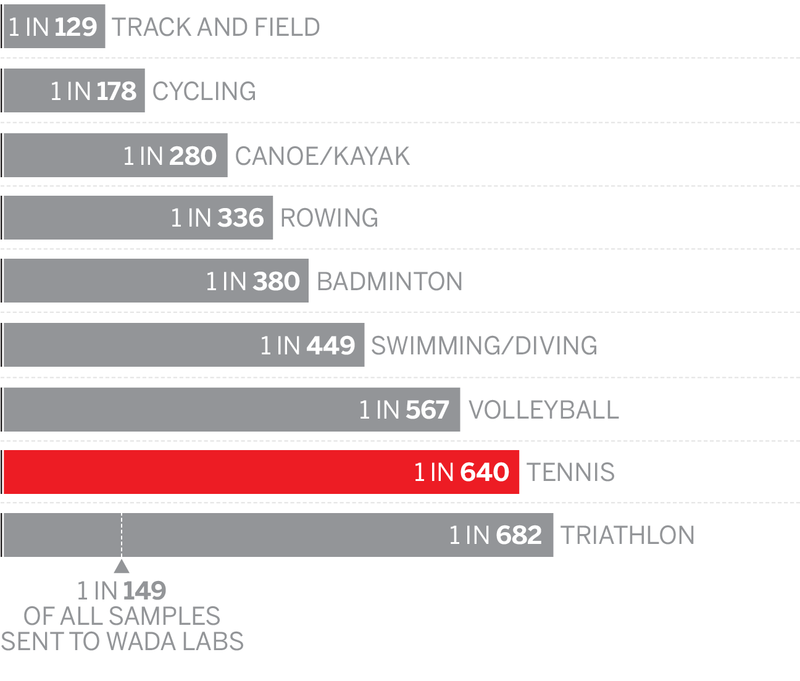 Since 2010, according to the latest WADA report, only one in 215 samples collected in tennis resulted in a positive for any type of prohibited substance -- about one-third the rate reported by other summer Olympic sports. Even when tennis has caught a player in a positive test, the players are not always suspended. According to WADA, in 2014, the most recent year in which information is available, only 40 percent (six suspensions out of 15 positives) of "adverse analytical findings" (positive tests) led to a rules violation or suspension in tennis, one of the worst rates among summer Olympic sports, in which the average that year was 65 percent. Miller said he doesn't believe tennis' overall drug-testing efforts are lacking at all, saying the sport's leaders strictly follow the WADA code. He said tennis' testing effort is most rigorous at the sport's highest levels, estimating that the top 160 players are drug tested between 10 and 20 times a year. He said it's unrealistic to expect tennis to test every player sample for every substance -- unannounced and out of competition. "The cost would be enormous," he told Outside the Lines, hanging on his final word for emphasis. "If you had endless money, you would test every athlete for every substance on every day of the year." Miller says 1,032 players were drug tested last year. The ITF is tennis' governing body and administers the anti-doping program for the sport, which has billions of dollars in endorsement, sponsorship and TV rights deals booked over the next several years. The ITF has an annual anti-doping budget of $4 million, Miller says, nearly double its level in 2013. By comparison, the men's and women's winners of this year's US Open took home about $4 million each. As for how much is actually spent testing for EPO, growth hormone and testosterone, Miller said, "I don't know the answer." WADA officials also did not provide testing cost estimates to Outside the Lines. Miller said, though, it might cost an additional $1.2 million to $1.6 million annually to test every athlete sample for EPO and HGH. Multiple sources who have either run or contracted with WADA-accredited facilities told Outside the Lines a full workup might cost $1,250 per player per test. Labs typically charge an additional $200 for a blood analysis to detect growth hormone, $300 to test for EPO, and $450 for an IRMS test. Catlin, who labels EPO and testosterone the most effective and widely used drugs in sports, has long advocated for advanced testing in big-money, high-profile professional sports: "Tennis is one of the [sports] that can afford it." Dr. Margaret Goodman, president of the Voluntary Anti-Doping Association, which provides drug testing in boxing and mixed martial arts, said her group runs complete panels on every professional boxer it tests to the tune of $1,300 per sample analysis. "For them not to include EPO and IRMS on every collection is a travesty," Goodman said. "I understand the argument that it's too expensive, but you can't have an anti-doping program act as a deterrent without implementing the appropriate testing panels." Last year, in a push for more advanced testing across all sports, WADA imposed sport-by-sport minimum testing for both EPO and HGH. Tennis had been testing for EPO over the prior three years at a rate of one in 16 samples taken, but the new WADA minimums moved that to one in 10. Tennis has had a mixed history with HGH testing: From 2010 to 2014, the most recent span data are available, tennis' HGH testing rates fell below those of other Olympic sports, but in the past three years, it has tested at a higher rate than the new WADA minimums require and more than other sports. Dr. Rodrigo Aguilera, who previously headed WADA-accredited labs in both Lisbon, Portugal, and Madrid, Spain, said he is confident synthetic testosterone dopers would be exposed if IRMS tests were more routinely run. Aguilera developed the technique in the early 1990s that differentiates between the body's natural testosterone and a synthetic or pharmaceutically produced version. However, WADA itself has given tennis and other sports cover, with an official telling Outside the Lines that there is "no logic" to applying IRMS solely as a screen test, but rather suggesting the advanced test be used only to confirm suspicion of synthetic testosterone in a urine sample, or what's known as a nail-in-the-coffin test. WADA recommends looking for variances in athlete steroidal profiles (also known as a biological passport) before submitting suspicious samples for confirmation via IRMS analysis. Miller said tennis has begun doing more out-of-competition testing and relying more than ever on the biological passport program, which looks for changes in blood chemistry from an individual's baseline profile as a possible indicator of doping. The biological passport is viewed by experts as a nice tool to have, but it is not a cure-all, and the jury remains out on its effectiveness. To date, tennis has developed profiles on about 600 players, though the passport program has yet to result in a doping case. In recent weeks, documents unearthed as part of an alleged Russian hack of WADA records show WADA overturned two decisions by the ITF and signed by Miller to allow women's player Bethanie Mattek-Sands to use DHEA, a banned supplement that is thought to increase testosterone levels. Mattek-Sands, originally from Rochester, Minnesota, captured the women's doubles title at the US Open last month and a gold medal in mixed doubles at the Rio Olympics. Her requests for the therapeutic-use exemptions -- in 2013 and 2014 -- were granted before WADA overruled the ITF. Miller has said the Mattek-Sands exemptions were the only ones granted by tennis to be overruled by WADA during his 10-year tenure. Richard Ings, former head of the Australian Sports Anti-Doping Authority and prior head of the professional men's tour anti-doping program, said tennis' anti-doping efforts have improved "a lot" recently -- though he still expresses concern about too little testing at the sport's lower and middle levels. USADA chief executive Travis Tygart said the program is by comparison "miles ahead" of the collectively bargained National Basketball Association's efforts, but still falls short of the upgraded international cycling program or the domestic anti-doping program overseen by USADA. Tygart also pointed out that tennis continues to contract with a private sample collection agency rather than USADA and national anti-doping agencies in other countries, which he said leave too much control in the hands of the tennis federation. Today's tennis is a more physical and taxing game than the one played a generation ago by Bjorn Borg and Chris Evert. Individual points are more intense, movement is now hyper-aggressive. The players, ultra-athletes who train as hard off the court as on it, are beautiful to watch -- graceful, athletic, strong, fast, powerful -- all while competing seemingly effortlessly. Generational icons such as Djokovic, Roger Federer and Serena Williams headline tennis' continent-hopping circuits from January to November, with an offseason that's not quite two months long. The resulting wear and tear on a tennis player's body is as significant as that in any other sport, even while the average age of men and women in the top 100 has risen by three years over the past decade. Former players and trainers told Outside the Lines the advantages sought and gained by players are not from PEDs such as steroids but enhancers used for match endurance, recovery and injury repair. Players get the edge by micro-dosing EPO, HGH, synthetic testosterone as well using an assortment of designer peptides, which stimulate the body to increase the natural production of certain substances. Such a practice is why testing at events, long a staple of tennis' anti-doping program, is mocked by experts as the equivalent of administering an IQ test. Unannounced, out-of-competition testing is much preferred. "EPO, in six hours you can't even detect it," said Aguilera. Low dosages of growth hormone, which aid injury healing and recovery, are only detectable within the initial three or four hours after dosing, Aguilera added. Similarly, he said the window to detect testosterone micro-dosing is narrower, and almost impossible to catch under the current WADA threshold. Aguilera said samples collected in competition typically detect "marijuana and cocaine" and not much else in "very high-profile athletes. Because when you go into competition you have to be very, very stupid to continue doping knowing that in competition you have a big chance to be [tested]." According to experts, the current top target of any testing program should be EPO, particularly in tennis. EPO, or erythropoietin, is a form of blood doping administered via injection that stimulates the creation of red blood cells and increases oxygen-carrying capacity, thus reducing fatigue and giving a player an edge. It, along with growth hormone, testosterone and blood transfusions, helped fuel Lance Armstrong to win the Tour de France seven times. Armstrong's first Tour victory came in 1999, the same year four-time tennis Grand Slam champion Jim Courier warned of EPO use on the tennis tour, saying: "I have pretty strong suspicions that guys are using it. ... EPO can help you when it's the fifth set and you've been playing for four and a half hours." Longtime tennis fitness trainer Pat Etcheberry figures it's being used in tennis today. "If it worked in cycling ... I would say, yeah," he said. "And some tennis players have the same doctors as the cyclists." Olympic cycling gold medalist Tyler Hamilton, a former Armstrong teammate and himself a former EPO user, told Outside the Lines that he believes two Spanish "blood cleaning" doctors he worked with a decade ago -- Luis Garcia del Moral and Eufemiano Fuentes, nicknamed "Doctor Blood" -- also had ties to tennis players. In the wake of the Armstrong investigation, the U.S. Anti-Doping Agency uncovered enough evidence to issue del Moral a lifetime ban, which the ITF in turn recognized. No player suspensions, however, were ever linked to either doctor by tennis officials. Miller told Outside the Lines that officials have been unable to link Fuentes to tennis, in part because they never received cooperation from Spanish authorities. As for del Moral's suspension, he said only: "We did other follow-ups that I can't talk about." Fuentes declined comment to Outside the Lines, and del Moral could not be reached for comment. Because of the scandals, Spain has often been viewed as soft on policing PED use, and Spanish tennis superstar Rafael Nadal has borne the brunt of allegations and rumors since joining the pro tour, even though he has never failed a drug test. Nadal filed a lawsuit this year against the former French secretary of sport for suggesting his absence from the tour at one point was not due to an injury but a penalty for a failed drug test. Nadal subsequently sent a letter to the ITF, asking officials to be more transparent in letting the public know when players are drug tested. The two other substances cited often as beneficial by elite athletes and experts are synthetic testosterone and HGH. While not proven to enhance performance, testosterone injections -- or, in some cases, administered in cream form -- have been found in studies to increase and strengthen muscles. Growth hormone is often used in conjunction with testosterone and other steroids by athletes, but its greatest value in sport is in recovery from muscle fatigue and injury. Despite the sport's longstanding reputation as being clean, some doping experts believe tennis is near the same high-risk level for PEDs as baseball, football, cycling and track and field. Roger Federer and newly crowned Wimbledon champion Andy Murray, in particular, have campaigned for more strident drug testing, though others staunchly defend the sport's current efforts. Former Davis Cup captain and ESPN analyst Patrick McEnroe said this year during a conference call with the media that "testing is very tough in tennis." Boris Becker, the legendary player who coaches Djokovic, recently branded Murray "out of order," noting the sport has random testing and players should be considered clean unless proved otherwise. "What I always say is if I ever had our athletes out there complaining that we are not doing enough testing, then something is wrong," said Tygart. "And we take that as, 'Shame on us. We need to step up our game in a big way.' Because the athletes know. ... It might be the word they hear or the things they see in a locker room, but they can't prove it. But to have athletes standing up and asking for more [testing] is a really powerful statement. And it ought to send a really clear message to those that are here to protect clean athletes -- that we need to do more." Seated at a conference table on the third floor of ITF headquarters in London, Miller preaches patience while describing tennis' anti-doping efforts as evolving. "We're at the cusp of a new program -- that will look at the evidence that we got, where we think we need to go and we'll make those changes as we see fit." In 2012, the lanky former basketball player performed the "risk assessment" behind tennis' current four-year plan, and he'll judge the level of doping in the sport again next year. Miller's last recommendations brought increases in out-of-competition testing and blood testing, as well as introduction of the biological passport program -- all since phased in. Out-of-competition testing barely spiked from 22 to 23 percent in 2013, the first year of the program, before rising to 35 percent in Year 2, according to data compiled by WADA. Data for 2015 has yet to be released, but Miller said it is up to 49 percent. Analysis of blood samples went from 5 percent to almost 20 percent the first two years, and now, according to Miller, sits at 45 percent. The target, Miller said, is eventually a 50-50 split in terms of both in-competition testing and the percentage of blood samples analyzed. When asked, Miller acknowledged that tennis has a policy for retaining athlete samples for future retesting, but refused to say when the program started or the number of samples retained to date. He offered only that retention is done on a "targeted basis ... [with] samples that we think need to be stored." Some longtime coaches and trainers said doping begins as early as the elite junior level among some players barely in their teens, when they claim drug testing is at best minimal. Miller, however, contended the tennis anti-doping program tests "quite a lot" at the junior level. But when asked the specific number of samples analyzed, he said, "I can't tell you the numbers, because we don't break it down by the age of the person who is tested." The drug czar added, "I'll be clear: Our view is that a good anti-doping program is not about the number of samples that you collect." When asked, though, to gauge the prevalence of EPO and growth hormone in tennis, Miller fell back on the importance of testing data, saying, "The only evidence of use that you have is the testing results that you have." Yet there has never been a positive test for either substance, other than Odesnik testing positive for a growth hormone peptide. Four other players have been caught for steroids since 2005, all at the time barely beyond the junior ranks: Sesil Karatantcheva, a 15-year-old from Bulgaria; Elena Madalina Capraru, a 16-year-old from Romania; Paco Climent Gregori, a 16-year-old from Spain; and Philipp Aleksanyan, an 18-year-old from Russia. Miller suggests tennis' efforts should be viewed from a broader perspective, one placing suspensions handed down for stimulants, marijuana and cocaine usage on the same footing as those for steroids and other heavy-duty PEDs. "If there is use that we haven't detected, yeah, of course, I am frustrated," he said.